After learning about the wealth of the henequen industry and history of haciendas in the Yucatan, I began to dream about the famous Mexican pasta tiles, old doorknobs, and various other antiquities floating in and around Merida. And so, browsing antique stores in Merida became a favorite thing to do. In addition to several antique stores in Merida Centro, there is a flea market every Sunday at 9 am where vendors sell “antiques and things” at Santa Lucia Park. And if you have transportation, I recommend getting out of downtown to explore this list of other antique stores in Merida. Location and hours are subject to change, so verify as you can using the links provided. You’ll know when you’ve arrived by the numerous old doors and architectural elements stacked in front of this antique store. Located in the Garcia Gineres neighborhood, this store offers a varied assortment of antiques and architectural salvage pieces from the Yucatan. There is not a facebook or webpage associated with this antique store, but it is one of the most consistent antique stores in Merida. 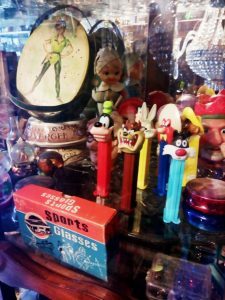 This Merida antique store is packed with small antiques such as old locks, antique Coca-Cola drink trays, a small Pez dispenser collection, and an antique eyeglass collection. 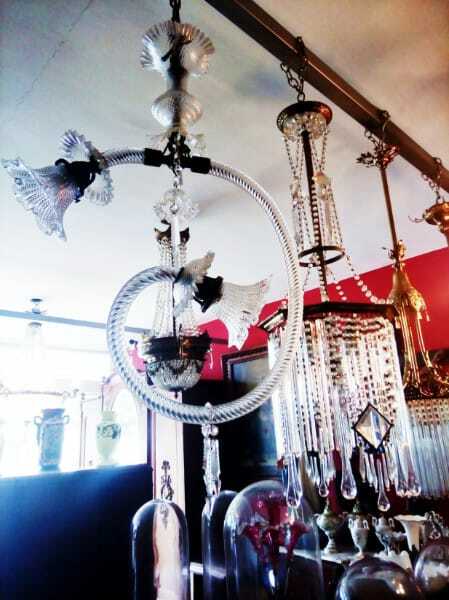 They also have a few large items such as light fixtures, but my favorite is the collection of antique rosaries. Most people discover this Merida antique store walking down Calle 60 and stopping to admire the sign. Hand-painted on an old door and adorned with a portrait of Frida Kahlo, it’s as intriguing as the collection of various antiques and treasures inside. This is one of the more high-end antique stores in Merida. The store is staged with antique living and dining room setups, but the big attraction is the large collection of antique chandeliers. From intricate European chandeliers to modern art deco styles, these light fixtures would look great in any historic home. A unique Merida antique store that does double duty. In addition to antiques, this location is also the art studio of a local artist. Two treasure hunts in one! This is a watch and jewelry store that also sells antiques in Merida. In addition to antique clocks and watches, this store has a selection of antiques for the home such as typewriters, record players, sewing machines, and a beautiful phonograph.